After the early morning torrential rain, the elements relented and Owenbeg was bathed in sunshine, although a stiff breeze still made life difficult for players. However, that can be no excuse for the ultra-defensive fare served up in the first half, both sides bringing a dozen (and more at times!) players behind the ball. It was cat and mouse football with attacks repeatedly breaking down against a defensive phalanx and no surprise that the sides were level at 0-03 each after an uninspiring 20 minutes! Adie Bradley pointed in the 2nd minute, Adrian O’Kane pointing a free three minutes later. A superb point from the outstanding Aidan Keenan put Castledawson back in front but Slaughtmanus levelled with a pointed Conor McGee free. Keenan landed another point in the 12th minute for 0-03 to 0-02 but a surging run from the impressive Kyle Gallagher set up Adie O’Kane to tie the scores for the third time. In the 24th minute Niall McNicholl put Castledawson back in front and in the final minute of the half Aidan McElhone converted a free to give Castledawson a 0-05 to 0-03 interval lead. 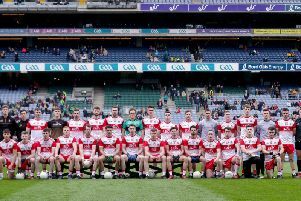 Within a minute of the restart Aidy Bradley had added two points to open up a three-point gap that was hugely significant in the context of a closely contested game, especially with the mercurial Niall Keenan standing guard in the Castledawson defensive line. Indeed, Keenan dispossessed Gavan McShane superbly and then popped up in attack to restore Castledawson’s three-point advantage after O’Kane had pointed a free and McShane also scored from a tight angle. Still Slaughtmanus showed great resilience and Gallagher set up Eddie Devine for a point, with McGee converting another free. At 0-08 to 0-07 behind in the 40th minute Slaughtmanus were well placed but poor decision making and careless finishing ensured that Slaughtmanus would score just one more point as Aidy Bradley, Kieran O’Kane and Aidan Keenan pointed to put the game beyond their reach.